Canberra: Joe Burns and Travis Head smashed big hundreds to end Australia’s century drought and put the hosts on course for a massive first innings total despite a wobbly start against Sri Lanka’s makeshift attack in the second and final Test on Friday. 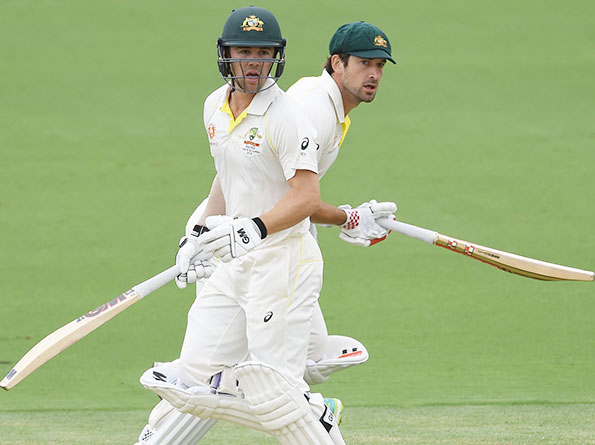 “Coming into the day’s play, we knew that the first hour was going to be pretty tough,” Burns told reporters, saying he was “bloody happy” to have reached his first test ton in three years. “So despite losing the three wickets, we knew that we just had to absorb that pressure that they posed to us. “But we were also aware that they were an inexperienced bowling attack that were going to present scoring opportunities if we could get through those tough periods.” On a chilly and overcast morning at the Manuka Oval, Australia captain Tim Paine finally had some luck with the coin toss, winning for only the second time in nine tests he had led the team in. But his joy was short-lived as Sri Lanka made early inroads despite being forced to go with a completely new pace attack with the injured Suranga Lakmal joining Dushmantha Chameera and Lahiru Kumara on the sidelines after playing the Gabba Test. Left-armer Vishwa Fernando, who was not in the original squad and joined only as a replacement for Nuwan Pradeep, struck twice in two overs to dismiss left-handers Marcus Harris and Khawaja with his outsinging deliveries. Debutant Chamika Karunaratne then picked up a wicket with only his fourth delivery in test cricket, getting Marnus Labuschagne (six) to edge behind. Burns hit 26 fours in his unfinished 243-ball knock punishing a Sri Lankan pace attack with a combined experience of five tests coming into the match. Both the centurions also benefited from Sri Lanka’s sloppy catching. “We put down four catches and at best times in the match,” Karunaratne rued. “No one wants to miss a catch. Whole day we were on the ground, maybe the focus was not there,” he said.